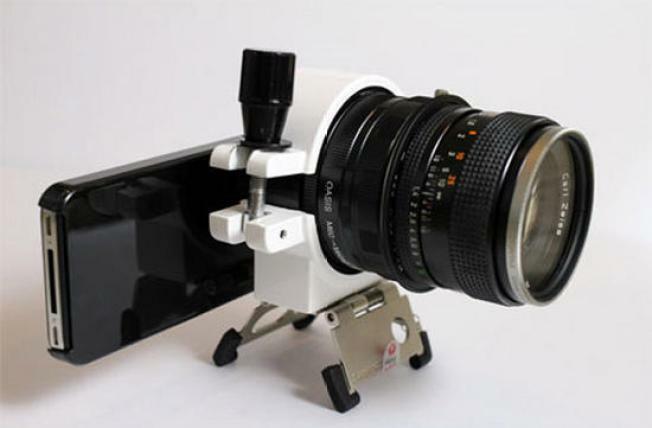 This setup on an iPhone 4 must be a joke — when we tried putting a similar lens next to our iPhone 4, it wasn't anywhere near useful. But we understand the fantasy, longing for great lenses and mounts with which to exploit the iPhone 4's newfound higher resolution and 720p video recording capabilities. Are such things possible with the iPhone 4? but none will give you that wonderful feeling of depth that a full-sized lens will. If you don't need extra lenses but just want a sturdy shooting platform, you can attach the iPhone 4 to a tripod holder, and the $20 Versihold Grip (pictured below) looks like it will fit just about any cellphone. One method we've tried but can't recommend is the Gorillamobile iPhone mount, which uses a suction cup that can't hold the iPhone securely enough to take the risk of a disastrous drop. But that Gorillamobile could also benefit from the Versahold Grip. For now, the pickings are slim. However, there will be demand for stabilization and lens attachments for the iPhone 4 with its higher resolution, and we'll be on the lookout for them.